How the notoriously uptight celebrity homemaker let loose and became a pop-culture behemoth. It’s no secret that we’re big fans of Martha Stewart around here. Yet only two years ago, we wondered if she was headed for a Britney-style breakdown. After a spate of shockingly unscripted late-night interviews, cryptic tweets, and the #struggleplates fiasco, it seemed likely we were at a pit stop on the downward-spiral express that ends with a Miley Cyrus make-out video. But today, Martha is on an upswing that’s unprecedented in her career. Following a string of bawdy TV appearances talking about threesomes and drinking 40s of OE, a Reddit AMA, and a mic-drop performance at the recent Justin Bieber roast—not to mention her blasé admission that she was “totally high” at the time—we’re comfortable calling it like it is: The 73-year-old domestic queen has become a full-fledged GAWD. But how did Martha—once the media’s favorite punching bag—re-emerge as the loose-canon, pop-culture darling that blows up our Twitter feed week after week? For decades, Stewart’s success hinged on total control of her work and her image. Her come-up was completely self-made. She started a catering business out of her Connecticut home in the late ’70s and was so damn good at it she got offered her first cookbook deal thanks to a book launch party she threw for someone else. By 1993 she had a magazine, a TV show, and a $50 million merchandising deal—all on the back of things like foraged seasonal centerpieces and hand-embroidered greeting cards. Everything was exquisite, beautiful, and basically impossible to pull off without a team of staff—and women ate it up. To non-believers, though, her behavior was more OCD ice queen than homemaker next door. It didn’t help that she had a reputation for a quick temper and harsh judgment, the sort of things that get successful men called “forceful” and successful women called “bitchy.” The 2003 TV movie Martha, Inc. portrayed her as a glass-breaking, tantrum-throwing maniac so unlikable you wondered when her head was going to start spinning. When she was put on trial for shady Wall Street dealings and ultimately sent to prison for five months in 2004, tabloids cheered. The new, devil-may-care Martha isn’t afraid of a little spanking. But over the last five years or so, Martha’s image took a decisive pivot, and her laid-back, devil-may-care attitude has launched her back into relevancy. Part of this personal-brand renaissance may have to do with the fact that, after nearly a decade of Empire-level dirty boardroom dealings, her business is back under her control, and she can relax just a little. That her current audience’s median age is 50 and shows no signs of getting younger is another warning flag; she needs fresh blood, and quick. The rebirth of Martha is not just a cynical outreach campaign—it feels like we’re getting to see a Martha that was always there, not one whipped up to win Twitter followers. It certainly helps that her aesthetic is much more relatable today. While using imported Italian canned tomatoes and keeping heirloom chickens seemed like ridiculous luxuries when she first started, now they’re standard #lifegoals of every Bushwick 20-something with an Instagram account. She’s no longer getting ripped to shreds every time a new recipe goes up, unlike in the ’90s, when making fun of Martha was a booming business (just ask the authors of three parody books, including Martha Stuart’s Better than You at Entertaining). That’s enough to get anyone to relax. The streets love Martha, too; while other celebrity chefs needed the food-obsessed Action Bronson to pull them into the rap lexicon, Martha’s been getting shout-outs and co-signs from hip-hop royalty for years. 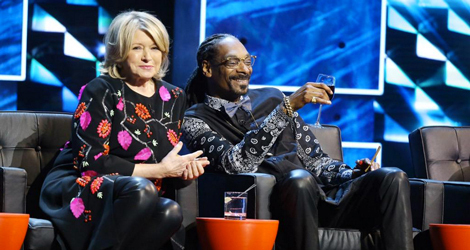 She and Snoop Dogg made mashed potatoes on her show in 2008, and he came back a year later to make green-sprinkled brownies (she was definitely in on the joke). And at the Bieber roast in March, Kevin Hart called her “the only white woman with more street cred than Luda and Snoop combined.” It’s obvious that her stint in prison helped people see something beyond her cookie-cutter image. When she gets name-dropped in a verse, it’s either for her time served, her skills in the kitchen, or both—not a punchline, but a boast. Still, only one artist has truly nailed the essence of Martha: Talking up his success on the Black Album’s “What More Can I Say,” Jay Z calls himself “the Martha Stewart that’s far from Jewish,” a millionaire who “just had the balls to do it.” Religious confusion aside (Martha’s not with the tribe either, Hov), that’s a page straight out of Martha’s playbook. There’s also something thrilling about watching a woman who’s spent most of her life trying very hard to be liked drop the charade and start being herself. Hillary Clinton is having a similar moment, though not nearly as fun, that started with her joining in on the “texts from Hillary” meme and reared its head most recently in her presidential campaign’s embrace of the pantsuit. It’s a sign, perhaps, that we’re getting to a point where powerful women can have a sense of humor without losing their cred; and there’s no question Martha’s still the queen, even though she’s started showing off her human side. In fact, it’s only made her stronger. Hail Queen Martha. Long may she ball.